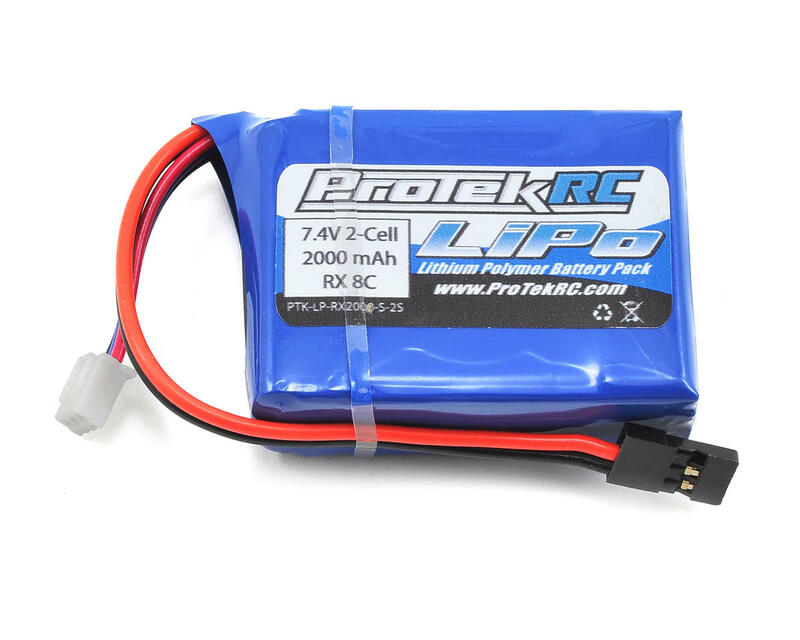 This is a Li-Poly 2000mAh receiver battery pack from ProTek R/C, made with super thick 20awg silicone wire! This super light weight Li-Poly battery is designed to power the electronics of 1/10th & 1/8th scale gas powered race cars, and was designed specifically for the Losi 8ight family radio boxes! The overall weight of your race car will be significantly reduced over the use of typical NiMh receiver packs. The battery voltage to your receiver and servos will remain constant throughout the race with the use of a voltage regulator (required). A constant voltage for your servos will ensure consistent performance at the start and end of the your race compared to typical NiMH receiver battery packs. Don’t be thrown off by the capacity rating of Li-Poly battery packs, as you will get awesome runtime out this pack! Unlike NiMH battery packs, Li-Poly battery packs do not lose voltage as quickly over time and can handle higher current draw than typical NiMH battery packs. Given that Li-Poly battery packs provide a higher nominal voltage (7.4V nominal), the actual capacity of the battery pack when compared to a typical NiMH battery pack (6.0V nominal) is about 30% more than the rated value (so this pack would be about the same as a 2600mAh NiMH pack in total capacity). Also with the use of a voltage regulator, Li-Poly battery packs will produce the same voltage to your receiver and servos at the end of the pack as it does at the start. This means the useable capacity of the battery pack is significantly more than typical NiMH battery packs, because most NiMH battery packs will produce significantly less than the 6.0V nominal voltage once they get below half capacity (ie: your servos will be a lot more sluggish if your typical NiMH battery pack is below half capacity). This is a great battery. I ran through about 12 tanks through my 8ight-T after a full charge and and it still had about 500 mah's left. Ran it unregulated with HV servos and performance was great. Used the flat cover for the battery box and was able to get it closed, but the fit is tight and the cover scuffs the top of the battery. 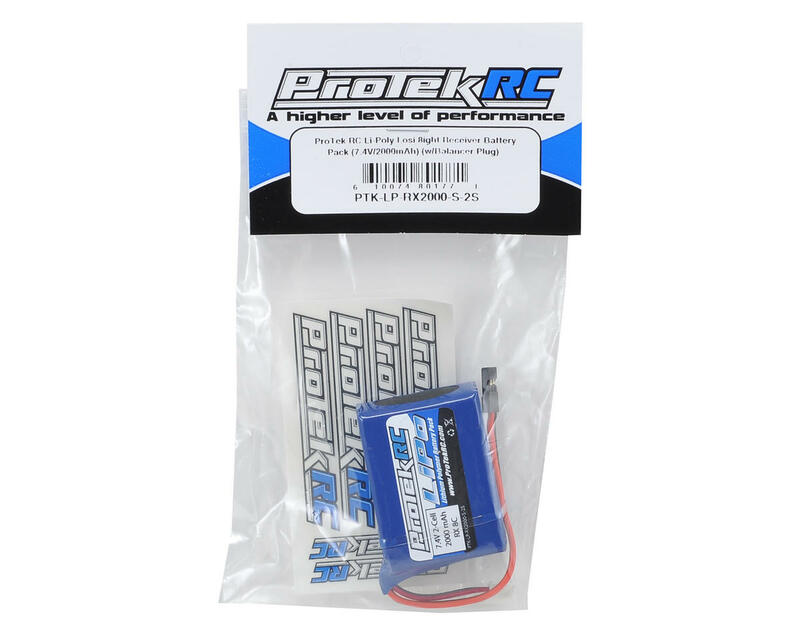 Awesome lipo receiver pack for my Losi 8IGHT 3.0 from Protek! Run time is amazing! Even after an hour long main not much drain on this battery and Im running HV servo's! Definitely recommended! This battery fits the Losi Eights much better than the actual Losi Rx LiPo packs. On top of that, if you grind on the bottom of the case a bit and remove the pad, you can use the flat RX cover. Ran a 20 minute main and a 5 minute warm with hitec HV servos and used 320 mAh. So far so good. I din't give it 5 stars because I've only charged it 4 times and don't have the best info on it yet. Great battery. Built well. I am a noob and left it plugged in to my rig for a whole weekend. Took it out to recharge and each cell was below 1 volt. I thought the battery was toast because it would give me a cell count error when attempting to charge. to my surprise I left the battery unplugged in a cool dry area and the voltage in each cell grew to about 2.7 v each... enough to be able to accept a charge. Fits well in my 8ight 3.0 radio tray with the flat cover and the bottom padding. snug fit but fits well. wiring is good too, 20g awg feels well built in hand not flimsy. Great Battery, fits perfectly in the Losi Eight 3.0 radio tray. Works perfect with no issues or puffing. I highly recommend this battery!!! I have had these packs for over a year and love them. I use them to power my Protek 150T and 150S HV servos. They fit the battery well. I use foam on the bottom and top of the box and have no problem closing the box. If using the flat top just slide the side with the screws under the linkages first and then slide the side with the holding tab under the box lip. I did kill one of my batteries a few weeks ago but it was my own fault. I was so excited about having a chance to run that I ran almost all day before I realized the battery voltage dropped too far. I would say check and charge the battery ever hour of run time depending on track size and design. I just ordered two more cause they are such a great battery. I am also going to use a low voltage alarm with them so I don't ruin another one. It fits perfect with the battery using the hump pack cover that comes with the kit. Pack fits great in our JQ white edition battery box. Very good run time, and balances out just fine. Bought two of these. Fit perfectly to Losi 8ight 3.0 using flat cover provided. Top battery. Fits 'snug' but well. Highly recomended as first lipo upgrade. You won't be disappointed. Fits the Losi box well and lasts FOREVER even with HV servos. Probably a full hour of runnning before I even worry about it, and its usually got lots of jiuce left. This is an excellent receiver pack for the Losi 8ight 2.0. Fits perfectly with the flat receiver box lid. The capacity is excellent as well! Just be sure to organize the wires inside of the box when you insert the battery. There is plenty of clearance. Fits good in the gen III 2.0 tray. Plenty of power to run the hitec 7950 High-Voltage servo . Fits better than the Losi Rx pack, performed wonderfully, ordering a 2nd one soon. I use this reciver pack in all my TLR 1/8 nitro cars and they work great with no failures witch is something I rely on to get me through those 45min mains!